Keep in mind the position. This position can be tricky to read- you really need to go on gut instinct. My take on this is that healing is in the process of occurring, the healing is deep, it’s reaching right into childhood patterns, right into the depths of the subconscious…. and it’s not yet finished. Also that the person might not be fully aware of the healing that is occurring. The healing may benefit the sacral chakra and its associated organs. Also look at Conservative Brown with Healing Green…these are nature colours, so putting this together with Idealistic Pink might translate as “Falling in love with nature all over again”. Watchful Blue in the heart chakra suggests that the heart is becoming wiser and more self-aware. There is a capacity to stand back from oneself and see oneself more clearly. Having Healing Green in the same spread reinforces this positive sense that the heart is healing. Combining Watchful Blue with Conservative Brown and Idealistic Pink, it can indicate a younger male. Mid-shade blues like Watchful Blue pull Conservative Brown back in age, making it younger! Also note the addition or Blue to Brown and Green further enhances the sense of being out in nature. Brown earth and rocks, Green trees and grass, Blue sky and water. Note the repeated colour combination on either side of the spread: red and blue. This is all about male/female or yin/yang energy…. most specifically, the balancing of your inner male and female energies- a dynamic that is reflected by your relationships with significant males and females in your day to day life. The overall spread suggests this relationship is healing, in the process of healing and needs to continue to heal…. (the sacral, where Healing Green is positioned, can suggest there is more to come, the work isn’t done yet). With blue on top the outward of surface demeanor might well be calm. With red underneath, there may be hidden passion, drive, energy. Blue tempers red, red energises blue. It can be good to channel the raw power of red through the filtering, self-censoring capacity of these blue colours. Ideally we do not want blue to repress red, or red to overcome the more reserved wisdom of blue. This is all about the balance of personality traits in terms of being a whole person who is wise and measured, yet powerful and passionate. In this spread, with Conservative Brown between the two blue cards, there has probably been some repression, some holding back of this power and passion. With Healing Green beneath, between the two reds, it suggest to me that the red colours are healing (they are being healed and can provide healing). Now I see a landscape where red berries and green leaves and in the foreground, and blue sky and brown mountains are in the background. “Nourishment from the ‘red berries’ will sustain you on your journey”. Red berries to me often represent the base chakra. They also represent nourishment in general because berries are little packaged explosions of sweetness, tartness, and energy. A small amount goes a long way. The nourishment of red berries might be more-ish but with Conservative Brown in the background you might be wise to conserve your resources so you can endure or go further. This is the restraining hand of Conservative Brown, and Blue colours in general, holding red back from its tendency to be leap in without thinking ahead. Red burns out quick if brown doesn’t anchor and slow it down. In the throat chakra, Honour Blue means you might be expressing yourself with honour, perhaps according to the values of your female ancestors, passing on your inheritance to the ones who are to follow in your own footsteps. Here we see an interesting dynamic. 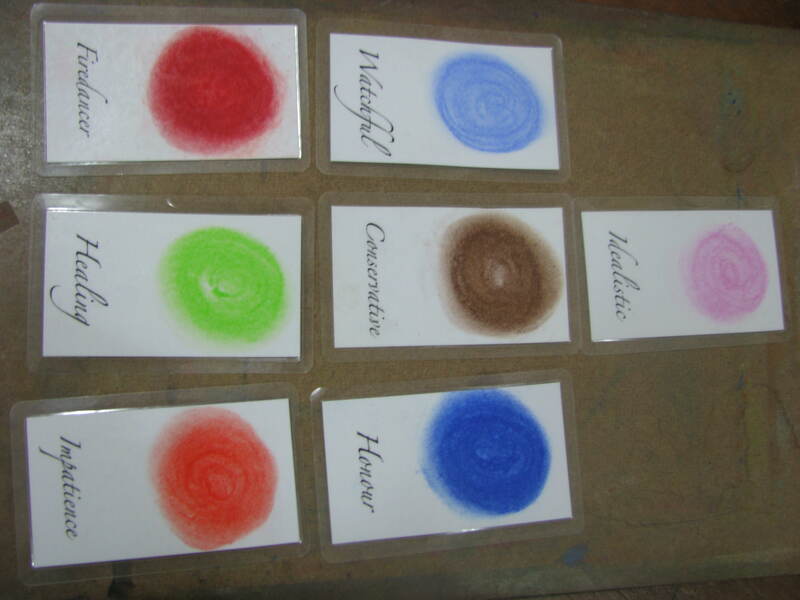 On either ‘side’ of Honour Blue we have two opposites: Impatience Red and Conservative Brown. We could just as easily say ‘the hare and the tortoise.’ We could interpret this to mean “Your integrity of expression is dependant upon finding a balance between your inner tortoise and your inner hare.” We can see the Healing Green colour is also sitting ‘between’ the red and brown colours so this is definitely a healing of opposites. Likewise, on the other side, we see Healing Green snuggled between Firedancer Red and Conservative Brown. Same kind of dynamic, but less about speed of movement and more about integrity of conduct. Firedancer can be wild and untamed….. she is the fire that longs to be set free. She can be sexual, uninhibited, impulsive and dangerous. Without her, Conservative Brown would be a brittle, old, stiff stick-in-the-mud. But without the dampening effect of the more conservative energy of Conservative Brown, Firedancer Red can burn out of control, causing harm to her dignity at the very least, but there is always the potential for scandal, violence and death with this colour. They need each other. They balance each other. We can say this easily when the colours between them are beneficial like Healing Green, but if the surrounding colours are difficult ones like Conflict Green or Resentment Green, the dynamic can be more polarised, with a person swinging back and forth between extremes or suffering an internal battle between opposing values. Lastly, with Impatience Red in the base chakra, surrounded by Honour Blue, Healing Green and Conservative Brown, we can say the future holds some challenges in terms of mastering Impatience Red (learning to be patient, slowing down, keeping your temper etc), but you have the potential to do well with these challenges because the surrounding cards are positive and counter-balancing.